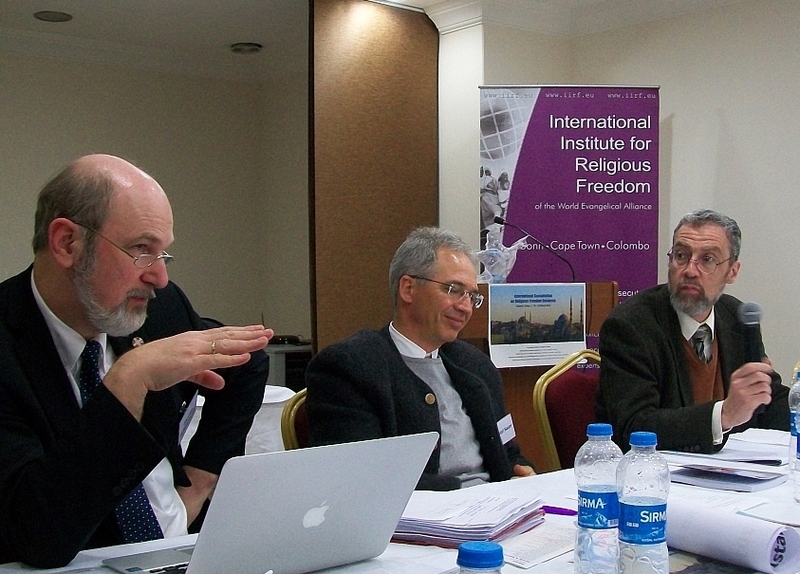 The recent International Consultation on Religious Freedom Research (Istanbul, March 16-18, 2013), held by the International Institute for Religious Freedom of the World Evangelical Alliance in cooperation with three universities, illustrated the rapidly developing professional standards for reporting and analyzing the global social problem of religious persecution. Dr. Thomas K. Johnson during his presentation. Johnson claims, contrary to much current opinion in the west, and especially contrary to the ideas of Karl Marx, that religions contribute packages of values, moral perceptions, and practices to surrounding cultures, such as the way in which Protestantism contributed a work ethic to parts of European culture, and that these religious contributions to cultures then shape the way in which whole societies, governments, and economies function, whether or not the people accept the underlying religious beliefs. These religious contributions to a surrounding culture are especially constructive and promote social well-being when they correspond with God’s natural moral law which God has built into human nature, including social relationships and practical reason. This theory of the relations among religions, cultures, and governments provides an account of the ethical origins of religious freedom, which is very different from the theories which claim that secularism or secularization is the ethical origin and guarantor of religious freedom. The many religions which do not have an inherent theocratic instinct, such as evangelicalism, have contributed to freedom of religion and can continue to contribute the package of values, moral perceptions, and practices which promote freedom of religion to more cultures. Participants of the International Consultation on Religious Freedom in Istanbul, Turkey. Glancing at history, Johnson sees Jesus’ poignant words, “Give to Caesar the things that belong to Caesar and give the things that belong to God to God,” as a crucial moral source of the perceptions and ideas which have promoted freedom of religion. Jesus’ distinction grew into the medieval “Two Swords” theory, which supported the development of civil society by allowing confrontation between church and state, and then grew into Reformation “Two Kingdoms” theory of ethics, as background for freedom of religion as promoted by evangelicals since Roger Williams. This history, rather than secularism, should be esteemed as contributing to freedom of religion and to the associated social benefits. In order to make especially clear that this moral development, from Jesus through the Reformation to Roger Williams, is different from promoting secularism, Johnson has proposed that Christians begin to use the slogan, “The Two-fold Work of God in the World” while teaching Christian ethics and continuing in dialogue with representatives of other religions. This way of talking can include the crucial moral insights of Jesus, the medieval era, the Reformation, and modern evangelicalism since Williams, providing a way to promote freedom of religion and the separation between religion and government that neither is secularized nor promotes secularism. There is a possibility that this way of describing public morality can become a contribution from the Christian community to more surrounding cultures, which might even be appropriated by representatives of some other religions, whether or not those people accept Christian beliefs about God and salvation.